Infosys appoints KV Kamath as new chairman. Is more change in store? Two years after the nominations committee at Infosys Technologies decided to appoint a successor to outgoing chairman N.R. Narayana Murthy, the company has finally chosen one. But the choice shows that the top management prefers comfort and convenience to anything bold or unexpected. Even as Murthy retires to hold the post of Chairman Emeritus for life, a friend of four decades will replace him as Chairman - Kundapur Vaman Kamath. Though the company's name too changed as it dropped Technologies, and a new board will soon be formed, the air of easy familiarity within the top management that prevailed while the founders ran the show remains, even as the firm seeks to re-ignite growth and improve profitability and catch up with fastergrowing Tata Consultancy Services, or TCS, and Cognizant. Despite the 21 per cent revenue growth and the gross addition of 43,120 people to its payroll in 2010/2011, Infosys is perhaps a victim of its own success. The firm has forecast its lowest margin since 2003 and is struggling to shrug off the tag of being too conservative - the charge that it shies away from acquisitions battles and takes a safe route rather than chase risky, aggressive growth. "To be a long-term player, every firm has to focus on high-quality growth," says V. Balakrishnan, CFO and a contender for a board seat. "There is little meaning to robust revenue growth without healthy margins." 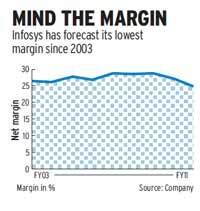 Infosys has the image of a highmargin player, turning down deals which may be large but offer low billing rates. Rivals such as Cognizant have seized on this conservatism, grabbing revenue and market share by opting for lower margins. Many believe the transition on April 30 was not radical enough. The changes are seen as minor, even as the firm clings to its own mantra of profitable growth. "The markets were expecting Infosys to combat its slowing growth and dipping margins with some substantial changes in strategy," Ganesh Duvvuri, Kunal Sangoi and Omkar Hadkar of Edelweiss Research wrote in a note issued to clients after the leadership announcement. "The company continues to work on its philosophy of 'profitable growth', which in the current competitive environment would be challenging." Infosys officials, however, say they will stick to the business model that has brought them great dividends in the past, and the upcoming changes in their top management structure - the appointment of a chief operating officer to replace S.D. Shibulal who becomes CEO in July, and three executive directors - is evidence of smooth transition. "Every successful corporation needs to transform itself periodically to remain relevant to stakeholders," Shibulal said at the press conference announcing his promotion to Chief Executive. "Infosys has always been paranoid about change." The company, however, has not been standing still in a rapidly changing market. It has announced consolidation of its existing eight industry units into four. Banking, financial services, insurance and healthcare will be clubbed into one unit; energy, utilities, communications and services into another; retail, consumer packaged goods, logistics and life sciences into a third; while manufacturing will be the fourth unit. Shibulal is also expected to lead Infosys's concerted foray into high-value services, even as it focuses on expanding its basket of intellectual property-based solutions and platforms to grow its non-linear business. Kamath needs to make some tough choices for Infosys. But the top priority is getting its succession planning right. "Kamath's appointment underscores the huge challenge Infosys has in transitioning to a new generation of leadership while it takes on the most difficult of strategies any of the Indian IT firms are attempting," says Peter Bendor-Samuel, CEO of outsourcing advisory Everest Group. Infosys also plans to set up a campus in China and expand its local headcount in the US. The 63-year-old Kamath earned his stripes at ICICI Bank, where he aggressively went after growth (incidentally, the bank's first offsite ATM was installed at Infosys's Bangalore headquarters). By the time he stepped down in April 2009, ICICI Bank's transformation into a financial services powerhouse was complete. "Kamath is an aggressive manager who likes to be in the top three positions in any market," says Vikash Jain, Partner, Everest Group. "Infosys will want some of this aggression to rub off onto its managers." The man himself is clear he will not interfere with the management of India's second largest software exporter. "I would say, you are available as a sounding board for executive management… It is not a daily oversight of management at all," he told BT in Mumbai days after his appointment (See "We will have a newlook board"). "I have been quietly mentored by Murthy for the last 15 or 16 years," he said at a press conference in Bangalore. Current CEO Kris Gopalakrishnan bristles at the suggestion that the engine of Infosys has broken down and needs replacement. "We are committed to our PSPD model (predictability, sustainability, profitability and de-risking)… We grew at 26 per cent last year and we can sustain this," he says. "We considered many leadership models, but agreed that this one [Kamath as a non-executive chairman and Gopalakrishnan as co-chairman] is best suited to Infosys today." In his new role, Gopalakrishnan, 56, is expected to mentor eight to 10 key accounts for Infosys, spend more time with senior managers and provide guidance to his successor Shibulal. "Nothing is permanent in this world," says Gopalakrishnan. "But I have no plans of leaving the company early." By August, Infosys will have only two of its seven co-founders left in the executive management of the company they founded in 1981. "These people were professionals first and founders second," says Kamath. "They took great care and pains to make sure they did not stand anywhere in preference to professionals." Even as the founders fade out, there is enough evidence to suggest that a close-knit group of managers hold the reins and there are few fresh faces emerging at the top. The vertical heads are in charge of multiple businesses and units - B.G. Srinivas, for instance, heads European operations and manufacturing, while Ashok Vemuri heads North American operations, financial services, banking and insurance, and now healthcare as well - and this has caused anxiety in the ranks. "Infosys has a muchhyped succession management strategy," says one former assistant vice president requesting anonymity. "But it is hard to see yourself going beyond a point with founders and veterans holding so many positions." This has not escaped the attention of analysts either. "It is possible that the multiple responsibilities could be affecting the functioning of one or two portfolios under their charge," Viju K. George, Executive Director of JP Morgan, wrote in a report issued in March. Infosys needs to act quickly in a rapidly evolving market. According to a survey by tech researcher Gartner, no IT service provider holds more than 10 per cent share in the overall market, even though Indiabased vendors grew 18.9 per cent in a market that grew barely three per cent. "India-based vendors increased their share from 4.8 per cent in 2009 to 5.5 per cent in 2011," says Dean Blackmore, Senior Research Analyst at Gartner. Further, customers are increasingly splitting up contracts and Infosys needs to get comfortable in this multi-vendor arrangement, say analysts such as George of JP Morgan. In this environment of churn, it will be up to Kamath and the management to prove that Infosys is well prepared for the long haul.